Handcrafted from sustainable wood in Brooklyn, NY, brandnewnoise sound recorders let kids explore their voices in a decidedly non-plastic, non-digital way. They can record a message or music, then play it back at regular speed, or at a faster or slower pitch. Artist Richard Upchurch came up with the idea during a large, rather loud family vacation. With each child in the group came a noisy, plastic toy. 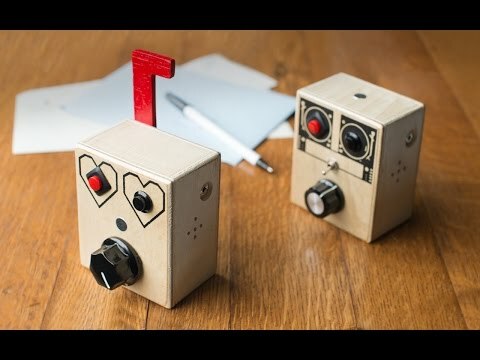 The experience inspired Richard to design a different kind of noisemaker for his nephew—one that required nothing but his nephew’s own voice and imagination. During show and tell at his nephew’s school, Richard’s creation created quite a buzz. All the kids wanted one. The rest is brandnewnoise history. 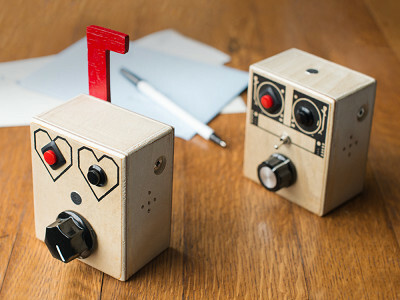 The Lil' Mib is a message recording box complete with pitch control and a flag to indicate that a new message awaits. 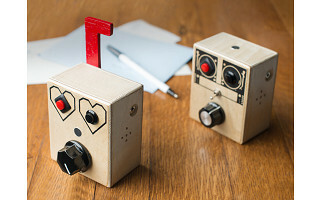 Loopy Lou is a sound recording device with a loop switch, pitch control, and output. Modern and minimalist, with a touch of nostalgia, brandnewnoise gives voice to a new generation of sound. I’m Richard Upchurch, the founder of brandnewnoise. These little sound recording gadgets all started as a gift for my nephew. I wanted him to have something to play with that didn’t have pre-recorded beeps and buzzes, something he could explore his own voice with, where everything he created was brand new. 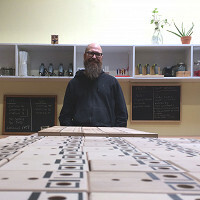 Each recording device is handmade in Red Hook, Brooklyn with sustainable wood. We are also a proud internship provider for local organizations for inner-city students. I'm smitten. What's the output port on Loopy Lou? 3.5mm or 2.5, hard to tell from the video. Also, is there any volume control? What are the basic differences between the two? 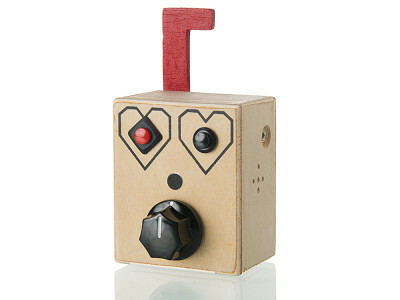 The Lil' Mib is a message recording box complete with pitch control and a flag to indicate that a new message awaits. Think of it as something you'd use to leave cute messages for your loved ones. 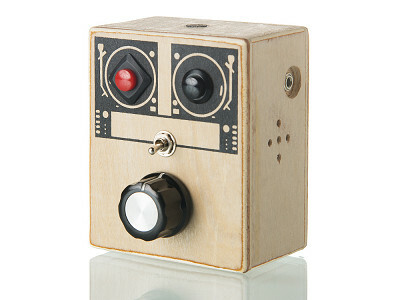 Loopy Lou is a sound recording device with a loop switch, pitch control, and output. This could be more to play with and discover how you change around your own voice. @Robin Hi Robin! Thanks for checking us out! Lil' Mib has a red flag that you can raise whenever you want to leave a new "voicemail" for someone. It's a real charmer. Loopy Lou (the one with the turntable eye design) has a loop switch, which means you can play whatever you record on a continuous loop. @Monica - Oh and I forgot to answer your other question! There is no volume control on the unit itself, but if you plug into speakers with volume control, it will comply. Does Loopy Lou have a "flag". Since Loopy Lou is meant for voice recording / looping and playing with your voice, it doesn't have a flag. The Lil' Mib is more designed for messaging and that's why the flag is there. @Rachel Hi Rachel! No, Loopy doesn't have a flag, but it does have loop switch, whereas Lil' Mib doesn't have the switch. They both have pitch control though. @Richard The video says that it adjusts both tempo and pitch controls but all of the Q&A comments here only talk about pitch. Can you clarify about what the controls do? @Paul Hey Paul! Thanks for the question. There is one potentiometer (housed under the knob) on each unit. When the knob is turned to the right, it speeds up the tempo of the recording, which in turn automatically ends up raising the pitch. Likewise, when the knob is turned to the left, both the tempo and pitch go down simultaneously. Hope this helps! I just had to note that after testing these with my kids (age 6 and 9), I'm convinced that either model would continue to be a favorite for years - they both loved them. They are also perfectly sized for kid hands, making it easy for them to play with. @Jesse Thanks, Jesse! That's so sweet and great to hear!! How is this powered? Please tell me there's a rechargeable battery on board. All the kids in my life have parents who have instituted "no batteries required" rules for their kids' gifts. @Parker Hey Parker! These little guys are powered by 2-AAA batteries. They've got a nice life span (as long as the loop switch doesn't accidentally get left on overnight!) and you can change them out when they're done. Unfortunately at this time there is no way to run these with an alternative source. Richard...my immediate reaction to your comment is "I love you Richard!" ("Internship Provider" I love it!) Where are you all located? Thank God someone 'gets it'...I'm a business education (CTE) teacher -"Professional Internship" & "Business Internship" courses were 'capstone' classes for me. My students had opportunities which could greatly impact their future. As a previous home-educating mom (4of7 daughters) -I ADORE your 'brandNewNoise" product. My girls are ALL grown up now! Congrats on your launch, AND your educational ingenuity. I'll be back for newborn 'babyGrands' in the future! @Ava Thanks for all the support, Ava! Our operation is in a tiny wood shop located in the Red Hook borough of Brooklyn, NY. Cheers! @connie Hi Connie, if you hold down the red button, either one can record whatever you like up to 30 seconds at a time. You would just have to aim the microphone close enough to the source you wanted to record. Hope this helps, thanks! Can Loopy Lou withstand being dropped from wheelchair height -- many times? If so, it would be perfect for a cerebral palsied friend that loves to manipulate the knobs on radios (to hear sound go up & down & change ) but can't hang on all the time.